It's Saturday, Sep 13 and the annual river cleanup is underway as volunteers fight off mosquitoes and scour the banks for trash! Watch for photos and results to come. 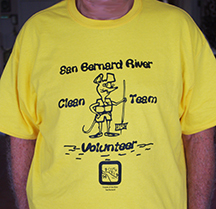 The Friends of the River (FOR) San Bernard annual River Clean-up will be held on Saturday, September 13th from 9:00 a.m. to 2:00 p.m. Boats and crew are needed to extract trash from the river and volunteers are needed to man the collection stations. Free tee shirts, water, and trash bags will be distributed at that time. Registration is not required. Immediately following the clean-up, all participants are invited to attend a hot dog social at Russell and Wana York’s home, 337 Lazy Oak Ranch, on the San Bernard River. Whether you have volunteered in the past or are new this year, FOR San Bernard hopes to see you on Saturday, Sept 13. It takes a team effort to keep the river clean and healthy. Contact Russell York at 713-824-2312 or email at russellyork@sccsi.net for additional information.